OMGosh! 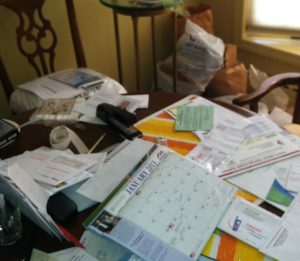 Are you over all the paper that gets sent to your home? I am! I really don’t need offers of maintenance contracts on vehicles I’ve sold. I don’t need to see all the types of cars I can purchase. I don’t need catalogs filled with clothing that does not suit my lifestyle or where I am in this stage of my life. But I still get these mailed to me and that’s an indication to me that it’s time to renew my no more unsolicited mail request online. I really don’t mind getting bills: electric usage bills, homeowner’s association bills, cable tv bills. These types of paper mail are reminders that I have a roof over my head, I enjoy all the comforts electricity provides and I have time to watch television instead of having to work 3 jobs during every waking moment. I don’t mind these mailings! Let me know how you feel about your reduced mail in about a month. And, sign up for my newsletter, no paper involved!